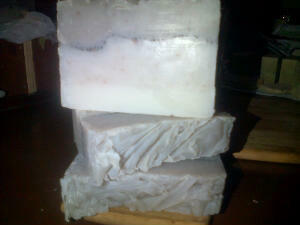 Coconut Lime soap. Smells like a tropical holiday! I’ve been meaning to try out this recipe for a while and finally did it to day. I’ve also wanted to try the pencil line so I gave both a go. At some point, I considered a gradient pour but tried to restrain myself…kinda. I settled for a creamy bottom and pink top layer. I decided to use poppy seeds for the line partly because I had loads available and partly because I didn’t want to get the strainer out/ mess with coffee/ cocoa powder. When I went to take a peek at gel phase I was shocked to see my pale pink top had turned GREY!!! A nice grey but a far cry from PINK. I’ve heard of colour morphing…now I’ve seen it myself. The result is so lovely, I’m claiming its how I intended it to turn out. The lather is AMAZING (coconut oil is the main source of bubbly lather and hardness in handmade soap) and the bars are hard as rock. Good thing I cut them earlier than I normally would. I had some crumbly sides but its all part of the ‘handmade charm’. 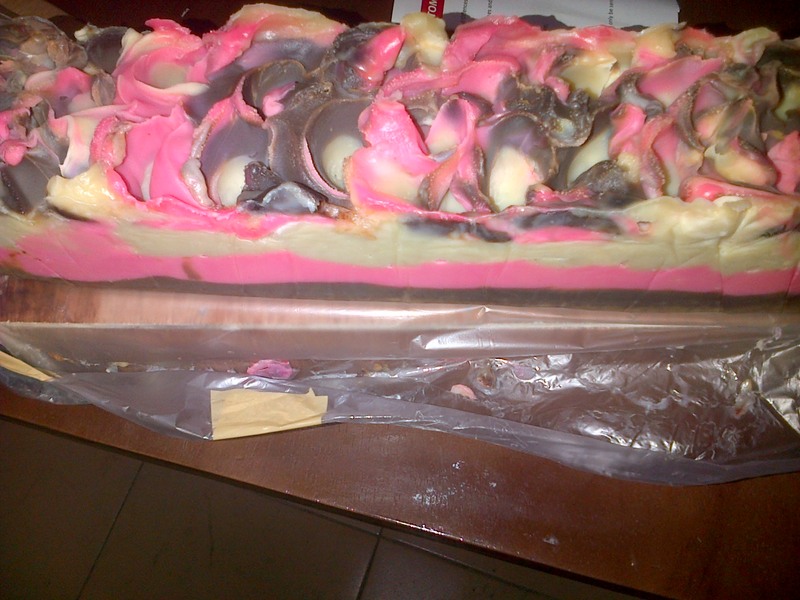 Not much of a name for soap but that’s what went in it. I tried some sort of pouring/swirl thing which ended up quite muddled. Rookie mistake: I didn’t use well defined colours and I swirled too much. Also, this recipe, I subbed some Soybean oil (20%) for Olive oil because I heard it gives creamy stable lather. 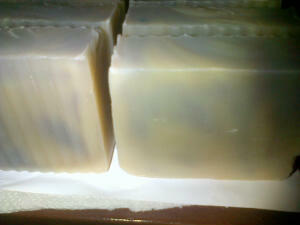 All said, its a good soap, scented with peppermint fragrance oil. I’ve finally soaped the rosemary infused olive oil after 6+ weeks. I used a combination of Aloe Vera and water (full quantity) so it took almost a week to be able to cut it. Soft like butter the first 48hrs! 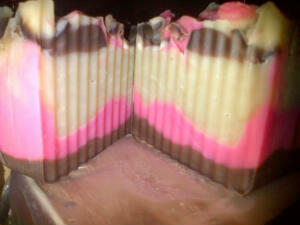 I added real dark chocolate to the chocolate layer and pink soap colourant for the strawberry layer. 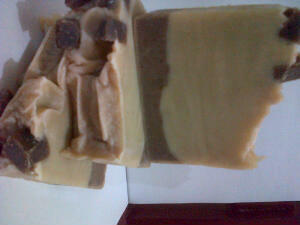 The soap is unfragranced because I just can’t bring myself to scent the cocoa-butter in this soap. With this batch I exhaust all my lovely infused Sunflower oils. It made my liquid oils smell very herby which I really liked. Another reason I couldn’t bear to fragrance the soap. Sad to see them go but Olive Oil is much easier to source locally and has a longer shelf life anyway. I’m really proud of this batch! 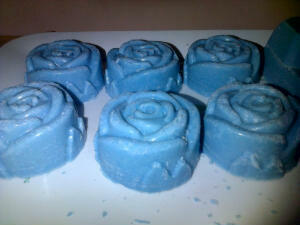 Finally got back to making spa soaps today. 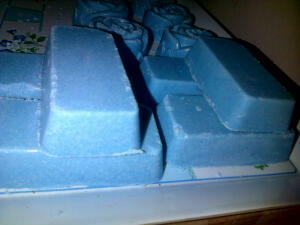 This is the re-do of the blue soap I tried last month. The earlier soaps have done really well because of the harmattan season (dry with little to no humidity in the air)- hardly a drop of sweat on them! However, these were more chipped (a little crumbled on the sides) than the other ones. Till next time – the final of the Mission 100 batch! 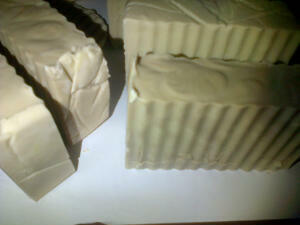 The only word I can use to describe how this soap smells is ‘creamy’. It will be a hard 4 week wait! 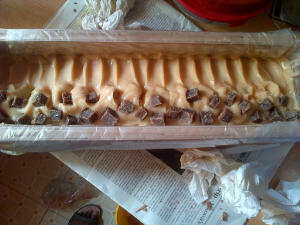 I just made my biggest, most luxurious batch of soap so far. I didn’t add any EOs because I wanted the cocobutter and coffee to come through naturally. The embeds are from a coffee soap I made last month and I finished it with a light sprinkling of pink sea salt.